Our company is one of the reputed manufacturer of Lifting and Material Handling Products. Our product range includes Lifting and Material Handling, Industrial Slings, Industrial Hooks, Industrial Clamps, Industrial Ropes and Industrial Equipment. We are supported and guided by our highly experienced mentor, Mr. Goutam, who has vast experience in this field. His transparent dealings, fair business policies and sound strategies have helped us to acquire enormous clients in the market. Furthermore, our company has carved a position for ourselves in the market. Our company is equipped with state-of-the-art infrastructure outfitted with latest and innovative technologies. For functioning in an efficient manner, we have divided our whole unit into varied departments like quality checking unit, R&D unit, production unit and warehousing and packaging unit. Being a quality centric organization, our whole range is sourced from trusted vendors who are appreciated for their superb services and high quality standards. To satisfy our clients, we offer customized services to our clients as per their particular requirement. We offer these services in terms of design, material of construction and dimensions. Our company is involved in offering wide range of and Material Handling Products to our esteemed clients. We have a wide distribution network spread across the globe. The factors that have given us appreciation are ethical business policies, in-depth knowledge and state-of-the-art infrastructure. Our organization is supported by hard-working team of experts who regularly work hard to achieve the client’s satisfaction. 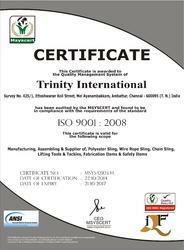 We have offered high quality range of material lifting machinery, equipment & accessories due to their expertise in their domain. Our teams of highly qualified experts are fully experienced and work together to achieve common goal. These people make use of all existing resources for delivering our products on time to our esteemed clients. To improve in the future, we take regular feedbacks from our clients to fulfill their particular requirement. Our team consists of technicians, field supervisor, sales and marketing executives, engineers, procuring agents, skilled and semi skilled workers and quality controllers. We have made connections with varied manufacturers to offer high quality products to our clients. 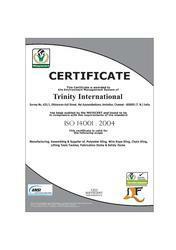 Our range, which is sourced from trusted vendors is acclaimed for their high quality standards. To prove that our products are procured from reliable and trusted vendors, the team of procuring representatives goes to vendor’s location and conducts quality test on various parameters. Apart from that, our customers are chosen on the aspects like their product quality, financial stability, delivery time and goodwill.